December 29, 2017, ©. Leeham Co.: The past year was a transition year for Embraer. Their E-Jet was in its last year before deliveries of the new E2 version begins. The company labels 2018 as an additional transition year, as the ramp-up costs of the first E2 deliveries, the E190-E2, will keep profits down. Strategically, 2017 has been a tumultuous year for Embraer. Boeing’s complaint to the US Department of Commerce for Bombardier’s CSeries sales to Delta at “dumping prices” drove the competitor aircraft into the hands of Airbus. This unexpected move saw Embraer and Boeing hold merger talks, plans which could be affected by the Brazilian government’s golden share in Embraer. The E-Jet took Embraer from a minnow in the airline industry to a top three position. After 15 years of production, the question was: How to replace the successful E-Jet? The decision for a makeover to the E2 version, instead of a new design, was a prudent move. The development of the E2 version with its new engines, wings and systems, has gone to plan. The first E2 variant, the E190-E2, will be certified early 2018 with deliveries to Norwegian regional carrier Widerøe beginning in April. The larger E195-E2 follows mid-2019. The E-Jet variant “holding the fort” during the transition to the E2 is the E175, with 83% of commercial aviation deliveries for 2016. This trend has continued during the first three quarters this year. The E175 counts for 82% of 2017 deliveries to-date. Forecast for the year is an unchanged 100 deliveries, enabling a modest Embraer profit. The E175 was specifically designed for the US scope clause controlled regional airline market. With the clauses remaining unchanged for many years to come, the sales of the present E175 got a new spring, as the E2 version will not fit the present agreements. SkyWest ordered 25 E175s in September and American Airlines 10 in October. Embraer pushed out the E175-E2 to 2021, hoping scope relief has happened by then. The E2 makeover took the E-Jet to a modern aircraft for the next 30 years, by it avoiding messing with Airbus and Boeing on their single-aisle turf. What happens when you do became clear during the year. Boeing decided to play hard-ball as Bombardier broke into their top US customer Delta with the CSeries. Suddenly the competition was on life-or-death and Bombardier opted out, arranging for Airbus to take over majority ownership and sales and support of the CSeries. In one move, Embraer’s competition was no longer equal sized Bombardier, but five times larger Airbus Commercial Aircraft. Once the transfer of the CSeries to Airbus is complete in 2018, Embraer competes with an Airbus sales now selling from 100 seats upwards. The prospect brought the long-standing Embraer and Boeing cooperation discussions into overdrive. An outright acquisition of Embraer by Boeing is unlikely as the Brazilian government has a veto capable golden share, but deeper alliances are likely. Embraer knew there would be a slump in deliveries before the E2 kicked in. It was for the Executive Aircraft division to fill this slump. A strong expansion of the division was decided. Embraer started the expansion with the hot-selling light jet Phenom 100 and 300 in 2008. Converting the regional ERJ-135 into the Legacy 600/650 covered the super-midsize business segment. Next development was the midsize Legacy 500/450 to compete with Cessna’s Citation Sovereign/Latitude and Bombardier’s Learjet 75. The Legacy 500/450 deliveries in 2015 and 2016 were encouraging at 23 and 33 units, but 2017 brought a standstill. Only12 units were delivered during the year’s first nine months. The lack of mid-size deliveries means Embraer has only delivered 59 Business jets during 1Q17-3Q17, of a Guidance of 105-125 jets for the year. To achieve Guidance deliveries within the last three months is now unlikely. Embraer forecast unchanged business jet sales for 2018, in a continuing flat market. Embraer’s primary Defense and Security customer is the Brazilian government. The only program aiming for a broader market is the KC-390 military transport. Designed to replace the widespread Lockheed C-130 Hercules, it has a potential world market. The two KC-390 prototypes have completed most of the flight tests and the Brazilian government recently declared Initial Operational Capability (IOC) for the type. Final Operational Capability (FOC) and first deliveries to the Brazil Air Force is expected in the second half of 2018. Still one white tail unsold. No one is going bring that quad back into production as even the USAF was trying to close off orders for years before the end. Impossible to get a program going and its a niche market. I have had thoughts it would be better to run production as slow as you can to pick up other orders. How many Air Forces in the world can afford it though? And note, they retired the first one, it was non compliant with the rest and was deemed harder to keep going that hang it up with a full fleet of them. A more than average far fetch thought. AB takes over the C-series, BA the E-Jets. BBD and Embraer combine forces on the remainder? One wonders what would motivate Embraer to give Boeing the E2. Boeing haven’t exactly done Embraer any favours. Any discussion between them is surely going to start with Embraer asking Boeing why they should join with Boeing just to save Boeing’s neck after Boeing’s actions caused it to be very difficult for Embraer to carry on as they were. If Embraer aren’t asking questions like that I’m sure the golden shareholder will. Maybe Embraer sees BA as having the muscle and wide-open door to the White house to change the US Scope Clauses. That could bury the CRJ900 and make the E175-E2’s sell like hot cake? Don’t forget the MRJ70 has the same weight problem. Getting the scope clause revised may end up helping Mitsu more than it helps EMB. While in the East, Both AB and BA see China’s aircraft requirement as a strong for good reason. Both the C919 and MC21’s are going through serious birth pains. Two huge government controlled entities actually being able to created a supported product is not going to happen. Its a huge leap from an Aircraft to a successful marketing and support and the confident of airlines to order. BBD failed and had to spin a very very good aircraft off to Airbus for nothing more than being a supplier. Dream on. LOL. ALPA/APA would fight—to the DEATH over this. No one—not even President Trump—wants that fight! There’s no political percentage in it (for BA or AB). Besides, it’s contractual between the airlines and pilot unions, and the earliest it can come up again is 2020–which also happens to be a presidential election year! “LOL II”. Thanks, didn’t know it was that serious. At least some good new for the CRJ900. The only thing that might ember from Boeing Embraer would be a C series competitor. Paid for by Brazil of course, marketed and supported by Boeing. E Jets don’t cut it as a C competitor. You have to be big enough to blow through scope and make it as a mainline carrier. That will happen anyway if it has potential to spite anything around BBD/Airbus. US politics is strongly dominated by vindictiveness. Completely unacceptable to frustrate US politics and get away with it. Just look at Cuba or NK. Just got an ugly feeling BA is going to win this round. I have learned more about AB’s assembly line in Boeing’s exhibits than anywhere else. Just pictures of AB fuselages and wings being shipped from all over to the US. The 737’s pure-bred American. Stuff Canada, but a high level US delegation is going next week to Canada to discuss N-K.
All politics is dominated by vindictiveness. Very good analysis to end 2017, but you forgot to mention the Super Tucano which is marketed through an agreement with Sierra Nevada and already assembled in the States. How will Boeing cope with that? Regarding the E190E2 a good option for Boeing would be stretching it by two seat rows using higher take-off weights, aiming to achieve a 3.000 nm range necessary to really do transcontinental flights. Maybe with E195E2 wings. The E175 was born in a similar way and is today the company’s best seller (although its market is based almost solely on the scope clause). Simply the passenger market and average aircraft size keep growing (due to increasing unit costs and traffic growth)and it is very difficult to do a much heavier airplane, like the E190E2 (without the A320 market basis), with the same seat number and keep the same seat costs. And it would be easier to compete against the C Series 100 with the same passenger capacity and range. The former Embraer idea of doing a 90 seater turboprop I hope will be forgotten. Not because there is a strong competitor but because it is a segment where airlines are small, have dificulties in obtaining financing and big leasing companies are not attracted by it. In simple words it is a very risky business with lower aircraft prices. Best wishes for 2018. 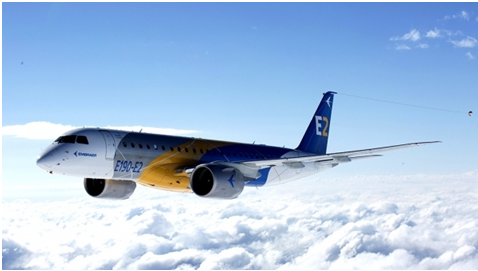 I agree that airlines are moving towards larger aircraft — and that’s why Embraer made the E195-E2 larger. Adding a couple of rows to the E190-E2 and increasing its range wouldn’t make sense IMO. The extra weight and extra flight attendant (from going over 100 seats in a standard config.) means costs would probably increase just as much as revenue. And airlines generally can’t make money flying a 105-110 seat plane on a transcon mission. Delta certainly isn’t buying the CS100 to fly transcon — it’s for short hops. This keeps coming back to a collaboration and owning any other part of Embraer other than co work on the KC390 will not be a part of that. It will be something that take over the 737-8 slot, maybe the 9, 125 to 180 seats notionally. Boeing focuses on the A321 slot and a separate project having nothing to do with Embraer. Missing is the Embraer Grippen NG tie up as well as the Tucano production. Neither would be part of any Boeing collaboration. As it seems to be working without massive cost over runs I would say its Boeing idea done right? I believe there is a great deal of synergy in the combination of Boeing, Embraer and Saab within the military market. Embraer and Saab are experts at doing a lot with a small resource base. With Boeing’s technology and reach, but focused on smaller and cheaper platforms. At the same time, because of its national character, both Saab and Embraer need to maintain a broad degree of independence from Boeing. It does not seem like a simple partnership to structure, but there is much gain in return. The Boeing / SAAB coop looks very much like a SAAB product rebadged as Boeing. but no value add. Caerthat: I don’t disagree, but the Grippen NG is also a direct competitor to the F-18. Boeing does not like to cooperate, so its that ying and yang thing, can they really do it? Boeing has the US market offering which is huge – its an interesting dynamic. I agree Boeing defense should benefit from the current AmFi political climate. Will the new trainer be selected during this presidency? Regardless Boeing seems to have a very strong offering here. Interesting Boeing can’t do it on its own. Boeing has not made anything under a B-17 class (B-47) or bigger. When it comes to smaller aircraft they just don’t have it. F-15 and the F-18 were inherited and I don’t buy that you get the history when you merge. Thank you. I remember the control issues that I think a US firm worked out for them, but had not came across that bit. Embraer profits being used to support stock buybacks to boost executive salaries even higher while playing with US politicians to keep competitors out & tax cuts in. The Brazilians parliament must be thrilled at the opportunity! Its truly a mess, something we can hope to change in the future but not holding my breath. Boeing is likely more concerned about Embraer taking on another project, final assembly of the MC-21 for western markets. Remember Embraer is far more of a successful ‘systems integrator’ of sub contractors assemblies that Boeing can only dream of. Getting a 200 + seater with a carbon fibre wing under Embraer name would have the executive row at the ‘Racecourse’ in Tukwila,Seattle in a blind panic. That would have to be final assembly and support. I don’t see it, but its turning into a strange world, and that is from previously already strange. You have some funny ideas. Complex partnership depends on cultural similarities and trust. I see exact zero probably of a Russian/Brazilian business case. Well the Russian and Chinese are having a go and if there is not a total lack of cultural similarity let alone trust there? I don’t see Russia giving away what it thinks is a crown jewel. Unfortunately for them , while the MC-21 indeed is a jewel, the fact is that what makes and empire work is the whole crown, traditions, laws and institutions behind it. .
Airbus worked indeed as a result of a generally shared culture and they let them do their jobs. No one is going to trust China or Russian not to have major meddling involved. What I said is about culture and trust not related to totalitarian regimes. Yes, there would be many complex business arrangements to be sorted for a Russian -Brazilian partnership to suceed. However its not a case of the Russians giving away their jewels, as anyone can find most of Embraers models are mostly made in places like, US, Korea, Japan, Portugal France, with the usual western suppliers of engines, avionics, undercarriage etc etc and that wont change with a final assembly of a westernised version with wings, fuselage sections coming from Russia. In theory Russia could let several companies buy “naked MC-21” sections ready to assemble and let them put on their own engines, systems, top coat and to certify their own aircraft. Like a large commercial jet kit plane supplier. You could then build your aircrafts with United Technologies integrated systems or choose Honeywell components unless you go for Liebherr-Thales-Moog and GE. The EASA/FAA are not really set up to handle this right now I assume. In theory you are a dreamer.